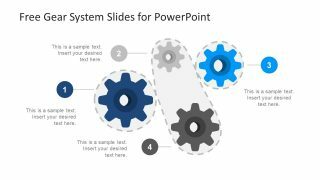 The Free Gear System Slides for PowerPoint are the professional templates featuring flat clip art and icons for processing ideas. 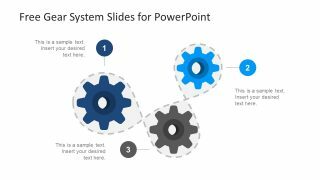 The amazing PowerPoint has set of gear PowerPoint shapes to illustrate the process and their functions. The template is highly suitable for professionals in the field of engineering and technology. For example, the technical project manager can demonstrate the core function of a product to the team. This free template is also helpful for presenting the functionality of certain tools and software. The PowerPoint of gear system has two slides to demonstrate three and four segment models. The shape of gears itself is a metaphor for tools, problem solving and producing desire results. Therefore, the users can present wide range of topics like business planning, development, executing strategies and identifying processes. The Free Gear System Slides for PowerPoint is also an illustration of assembling processes to perform a specific task. The three gears slide has the dotted line around these shapes which portrays a complete system. Here, a user can present the flow of activities into each process. Also, the free slide contains placeholders to add important textual content. Further, the users can change the colors and sizes of gear shapes in PowerPoint. Although, these are the flat design vector icons as a set of layer objects. The users can also make changes in each individual object by grouping and ungrouping them.